Computer glasses protects our eyes from Blue Light – What is computer vision syndrome? 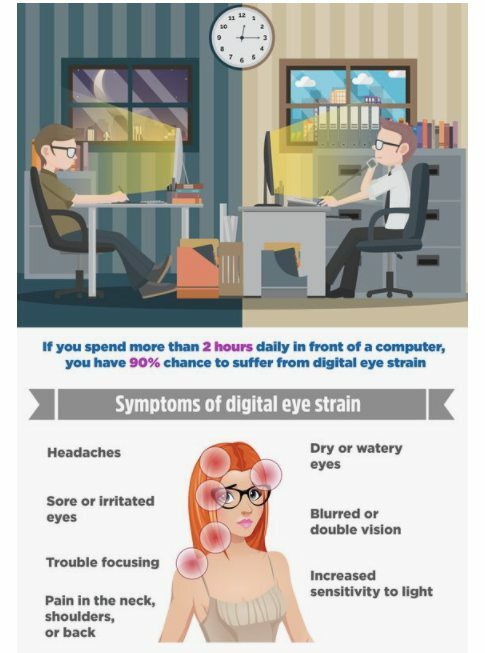 Do you get computer eye strain? In this article we shall explore the causes of CVS and eyesight problem like computer eye strain, the main precursor to the spike in interest in gaming glasses aka computer glasses. The cause, problem, solution, product related to Computer Vision Syndrome CVS. CVS is actually a mixture of discomfort arise from prolong usage of computer. According to American Optometric Association , CVS is include eye strain, dry eyes, headache, blurred vision, neck and shoulder pain. What causes computer eye strain? Many people are suffering the side effects of extended long hour computer usage. In fact, the problems bother computer users long time ago. The screen light can cause strain to the eyes, especially for those who use computer more than 6 hours a day. Fortunately the advancement in technology lead to innovation of computer lens (computer glasses). Let’s explore some important eyecare facts and tips below. We live in an age when we cannot do away with looking at the computer screen, or our smartphone. Working in an office means using a computer. Ophthalmologists suggest the best way to avoid computer vision syndrome is to provide our eyes a time for relax frequently. Constant staring can lead to eye strain and can blur our own vision temporarily. Looking directly into the distance once in awhile can help as well. Doctors suggest that shutting eyes for a couple minutes right after every 20-30 minutes, may help to lubricate plus moisten our eyes. When we are constantly focusing on near object such as computer work and paper work, we tend to over use our eyes to “accommodate” to near work. In long run, our eyes get tired and this is when the headache and eye strain will kick in. What people normally do is to rub the eyes, but we suggest massaging the eyes will work better. Besides, try to use the 20/20/20 guide where for every 20 minutes of near work look 20 ft away for 20 seconds. The reason behind the extra work load our eyes need to do in handling long hour of near job lies in the concept of accommodation. The general idea is that the nearer object we need to focus, the more work our eye muscle need to do to provide sufficient power through our crystalline lens. Read more in the link. Just because your glasses have to be changed each few years does not always mean that they are weakening your own eyesight. Glasses only help you see better, and in some cases more comfortable especially when it provides adequate power to see things. The vision changes happen only because we do not practice healthy working habit and do not take care of the eyes. A person need to be careful when they are doing makeup, especially thickening the lashes or using kajal in the waterline of the eyes. Experts state that the make-up particles that gets trapped below the outer layer of the eye can trigger eye issues. There are usually remedies say doctors plus you could also use antibiotic drops. Quit smoking, because it simply increases your own risk of macular deterioration. And that is one of the leading causes of loss of sight. The harmful after effects of smoking include damage to the small blood ships of the retina plus optic nerve. This type of damage to internal parts of the eye can cause loss of eyesight. Even when your contact lens pack declares that it is great enough to even be worn overnight, you should never do it, say eye doctors. Taking care of your contact lens in the right way is vital, as it might lead to loss of eyesight. One must soak lens in disinfectant solution overnight, wash it by scrubbing all of them only with thoroughly cleaned hands, and then store them in a clean environment. We tend to rub the eye whenever it gets itchy. It feels as if the more we rub it, the better we feel, end up with reddish eye. However, this is a very bad action as it does not only put stress to the eye but also injure the cornea surface which may lead to astigmatism. When the cornea surface is no longer as smooth, astigmatism kicks in, this process is irreversible. With a large demand for computer glasses, comes large volume production of computer glasses products which makes it cheaper to produce, just a simple economics of scale. 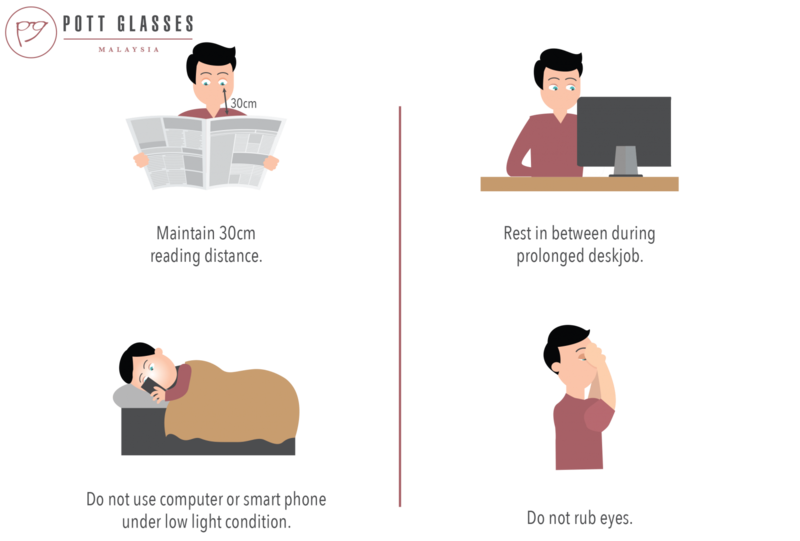 If you suffer from computer eye strain, do consider a pair of computer glasses as it has been specially designed to counter just that problem. Can computer glasses protect eyes from computer blue light? Read on to learn more about eyecare and computer eyewear protection. Long hours of computer usage can cause computer vision syndrome. There is no one specific problem of (CVS) Computer Vision Syndrome. In fact, there are few problems such as dry eyes, blurred vision, double vision, headache and eye irritation. Why is this so? There are two major reasons to this. First is the harmful blue light and the glare from screen. Second is about eye accommodation. By now we have a common understanding that computer light source is considered artificial light from LED. In this light source, there is high intensity of blue ray, wavelength of range 380-453nm. Don’t get us wrong, this ray also exists in the sun light, where it acts as an indicator to tell our body about day and night. However, the intensity from computer screen is way higher, thus causing harm to our eyes. Thus, computer glasses with the function to cut away the ray will help to reduce the harm the ray does to us. The idea is simple. Just like a metaphor to jogging, our legs get tired after long hour of jogging. Our leg muscles are working hard to keep up to the movement. Same as our eyes, the eye muscles are working hard to keep image in focused. We now go slightly deeper on how our eyes work. Read more here. What is happening in our eyes now? When this happen, computer vision syndrome (CVS) will kick in. You may start to feel headache, eye irritation and eye fatigue. This all due to too much work done by the eye muscle. Here is where a computer lens with intermediate prescription comes handy. 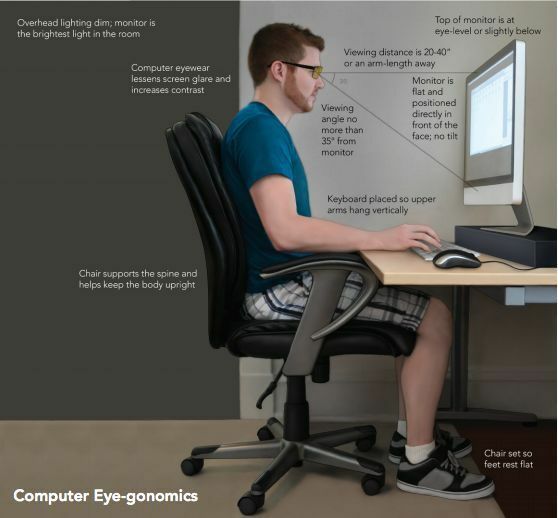 Computer screens more often than not are situated 35 to 55 cm from the user’s eyes, which is considered the intermediate distance. Computer lens eyeglasses come in ideal intermediate distance, with less negative power. When the overall negative power is lesser, your eye muscle do not work so hard to stay focus on near object, thus reducing the computer vision syndrome symptom (CVS). In fact, this prescription is sufficient to work well within the office area. However, if you are looking for a single pair that can work well for every range of vision, you might be better to stay with the distant power with blue coating lens. At least that helps to cut off the harmful blue rays.